I am currently using three large format cameras and one medium format. 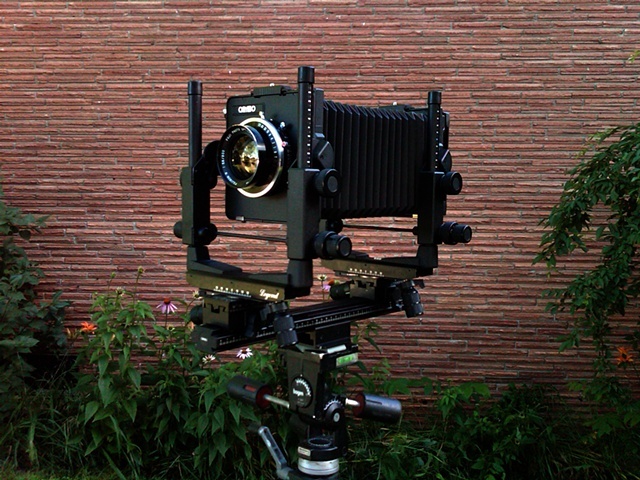 I recently added a 5x7 Kodak View camera built in the 1920's that has it's original 7 inch Goerz lens. My most used field camera is a Zone VI wooden field camera. I also have a Cambo Legend monorail. Both are 4x5 format and they share five lenses: 90mm Schnieder, 125mm Fujinon, 150mm Nikor, 210mm Caltar, and a 300mm Fujinon. My medium format at this time is a Pentax 67II with a 45mm, 55mm, 75mm, 105mm, 165mm LS, 200mm, and 300mm. Over the years I have used many different models\types of cameras including large, medium, and 35mm format. Many of my earlier works were taken on a Bush Pressman Model D and Mamiya C330's. The Zone VI was the only "new" camera I have ever bought. During my early years I shot a lot of 35mm film but, slowly made the conversion to larger negatives which better interpret what I am trying to capture with natural light.